With this fall weather in the air, I’ve been craving one of my favorite foods — butternut squash. It is by far my favorite vegetable (although it is TECHNICALLY a fruit because it has seeds). While my Dad may disagree with me on this one, preferring his orange cheez-its, the tangerine flesh of butternut squash is a nutritional powerhouse. It provides plenty of dietary fiber, vitamin C, it is also provides significant amounts of potassium, good for muscle recovery and bone health. Perhaps its most significant health benefit is that it provides beta-carotene, a vitamin that is shown to enhance immunity and guard against various types of cancer. Pretty sweet, huh? 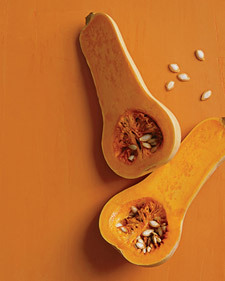 Butternut squash is great in soups, stews, mashed up (like potatoes), and thrown into pastas. But my favorite way to make it is roasting, which brings out it’s delicious sweet flavor. Take 1 butternut squash, cubed into one inch pieces. Toss pieces in a baking dish covered with cooking spray. Add 1 tsp walnut oil and 2 tsp brown sugar. Add salt and pepper (just eyeball it). I usually throw a little more cooking spray just to coat all the pieces and toss them around to make sure all the different ingredients coat the squash. Enjoy a a side dish, in salads (I make a mean butternut squash, goat cheese and chickpea salad), or as a delicious snack! Sarah! oh man girl – that sounds delicious! and that salad…I’m DYING! you’ve gotta tell me exactly what you put in it because it sounds phenomenal! I’m so glad I saw this post because I’m heading to the super-market, squash it is! i was just thinking about making my inaugural fall soup: butternut squash, of course! i love the simplicity of your recipe and will make it instead.